I'm interested in the uniPulse for triggering my 606 but your site says additional hardware is needed. What is the additional hardware? Can't I just wire the uniPulse trigger to one of the 606 voice inputs (for example R69 for the bass drum)? I'm handy with electronics so I can probably make it work if you can tell me what I'll need to add. Thanks for any info. the 606 and 808 are kind of specific the way they work internally. The trigger signals come from a common bus and are then 'anded' with a common trigger and accent signal. At any given moment, even when the 606 is stopped the signal at each voice is either high or low and there is no way of knowing which. So if you supply an external trigger and a common trigger, you usually trigger multiple voices. Together with a 3rd party we designed a nice little circuit 'the additional hardware' that supplies 'inhibitor signals' when a voice is triggered. It Plugs on the unipulse board and works very well in an 808. It was going to be produced and available in our shop, but so far the 3rd party has not done that unfortunately. - You can not fit the unipulse inside the TR-606, there just is no space. Thanks for the info! Very helpful and good stuff to know. I do have a broken 606 (dead CPU) and I just want to trigger the voices via MIDI. 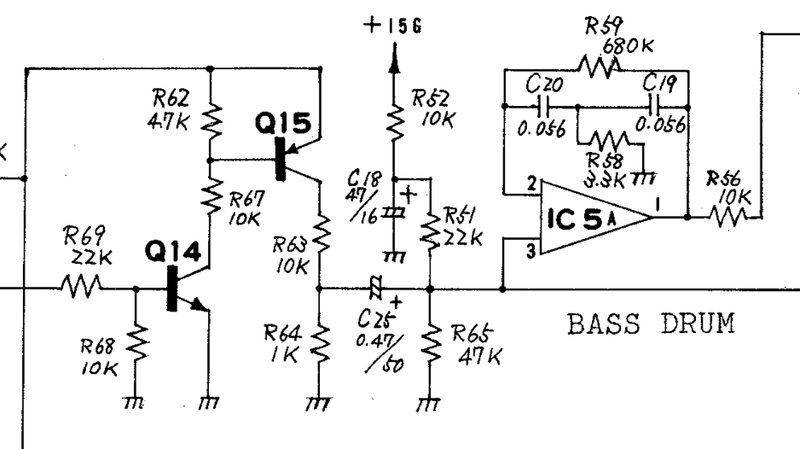 Which components would I need to remove from the voice circuits to achieve this? Would I just bypass the transistors on the trigger inputs? For example Q14 & Q15 in the bass drum circuit? I'm just trying to get an idea of how much tinkering I'll need to do before I install a uniPulse. Okay I got this sorted. For anyone looking to use external triggers with their 606 you can inject triggers at the PCB locations below (this just bypasses the transistors that control the trigger, I didn't remove any components but more testing needs to be done). I tested this briefly with the drum gate outs of a BeatStep Pro and it works great. All the 606 voices respond to velocity and gate times. I haven't tested open/closed hi hat muting yet; it looks like we might need to inject a clock signal to get them to mute one another with correct timing. Thanks again for the help, it looks like uniPulse will be easy to implement here. These are the points I would have recommended as well. I'm wondering if you succeed to get hit hat muting one another correctly, and how did you managed it. No trace cutting or part removal is necessary. The closed hihat mutes the open hihat anyway, can you explain what you mean?